One thing I have learned about border cuisine is not to ask too many questions about where certain foods originate, but to concentrate on going to places that are popular and eating what people recommend. In the case of Mexican style barbacoa a few experiences at random restaurants convinced me that I did not like this dish until I got some informed opinions about where to go, such as to Barbacoa El Azul in east El Paso. Finding out exactly what you are eating when you order barbacoa is not easy, because barbacoa can mean a certain cooking style regardless of the meat, or when it does refer to a meat it is usually lamb or goat. In El Paso, though, I am fairly certain it means beef cheeks (although admittedly I have not witnessed the process of meal preparation). The one important fact I have heard from my friends is that Barbacoa El Azul serves old style barbacoa as it is prepared in Ciudad Juarez. 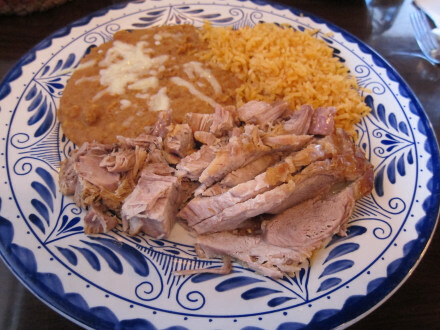 The important factor to diners is that the meat be lean and not greasy, as is the case at El Azul. Barbacoa is made fresh every day, and they serve it until it runs out (this is probably the reason Google lists Sunday as having an earlier closing time than other days, but it is really based on when they run out of food). Barbacoa is the only item served served here, and it is sold by the pound in the quantity you want (you can also order a half pound or get four tacos which I think is about equivalent to a quarter pound). They give you tortillas and condiments so you can make tacos out of them. Some of the chiles in the salsas have a flavor that somewhat overpowers the meat, but this is why it is critical that the meat not be fatty so that this would be the overwhelming flavor (and also give an aftertaste). All I can say is that after trying a lot of barbacoa dishes, I think it is important to go to a place that knows how to prepare it correctly, as I found at El Azul. Visually this is not the most appealing meat to me, but inside a taco you are not looking at the meat, but just tasting its deliciousness. 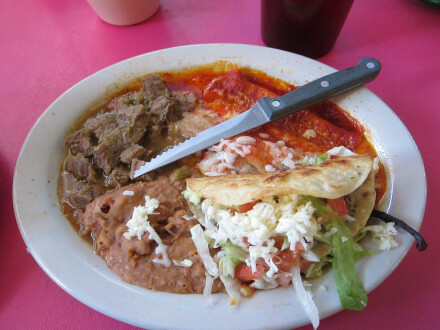 Yelp says there are several very good places to try it besides El Azul and this is fine, but I know from experience that El Azul is good enough to make a believer out of a barbacoa skeptic as I was before I came here. The Barbacoa can be ordered by the pound or you can get an individual order of four tacos (the price of four tacos was $6.25 when I went to the restaurant). It comes with tortillas to make tacos, and along with this are cilantro and onions along with red and green chile (the red sauce is made with chile de arbol and is the spicy one). This is all very flavorful and I would certainly suggest trying it for anyone who is interested in this type of food. Nothing else is served at this restaurant besides the barbacoa, but I think it makes a good lunch or at least a snack. People describe the meat as being very lean, and I think this is what makes it good. 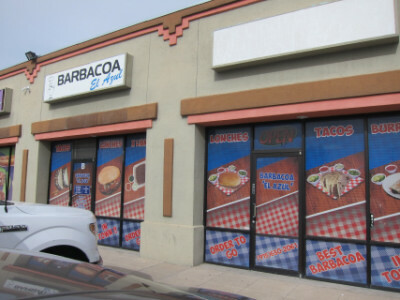 I have had several experiences with barbacoa that was not as good as the one here, and I know this restaurant has a reputation for being one of the best. 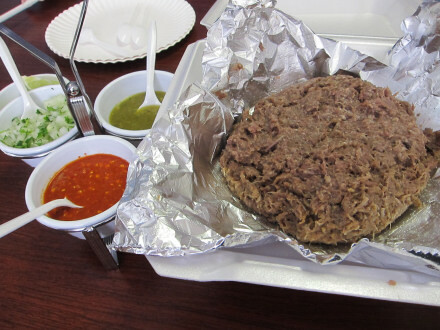 The barbacoa is made fresh every day, and they serve it until it runs out. My friends who recommended the restaurant say you are fairly safe at least until 1:00 p.m., and after that it depends on how busy they have been. Drinks follow the pattern of the menu, and you only get one choice–Mexican sodas. Fortunately these are the good ones that I have always liked, including Mexican Coke and fruit flavored drinks including manzana (apple). 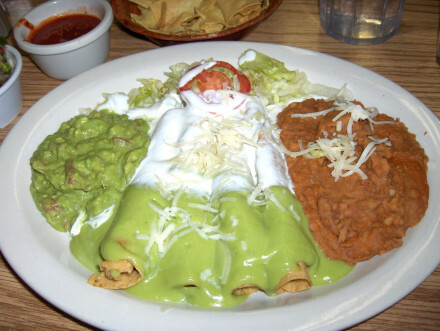 Restaurants in Mexico follow one of two patterns–either they just serve one item or one type of food, or they are restaurants as we know them with a varied menu. The first example gives a limited choice but it is likely where the best examples of their specialty can be found. Barbacoa El Azul just has one item but the dining room is like a regular restaurant where you eat at a table (they do not have wait staff but they will bring your order to the table). It is very casual and I think it fits a local trait where people want the best food they can get for very little money, but they do not want to pay for fancy things they do not need. There is no issue with language here–they speak English and Spanish. 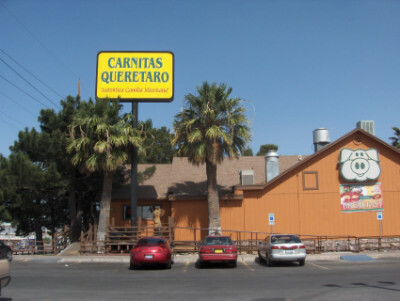 It is, however, very typical of border style restaurants. My chile index does not mean a lot for this restaurant–if you add a lot of red chile it might be 5 chiles and if you only use the green it will be about three. 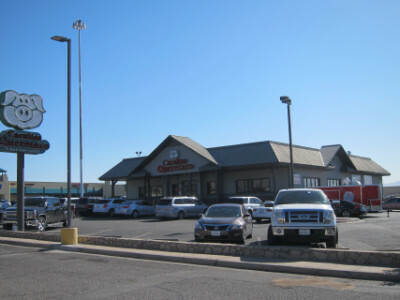 I think if I were to describe a Mexican style diner it might be based on El Jacalito in central El Paso. It is probably best known for breakfast, but it has a sizeable lunch crowd also. The sisters who own the restaurant know the large group of regular customers who come in, yet they remarkably do not look anywhere near old enough to have been running the restaurant for as long as I know it has been in operation. Of course the restaurant does depend on its regular customers (I know because I was one myself when I worked in the area and could go to the restaurant frequently). 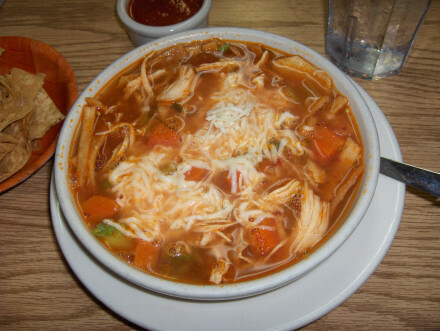 I always thought of El Jacalito primarily as being one of the three best places to get caldo de res (one of the others is now closed and the other is Jalisco Cafe). 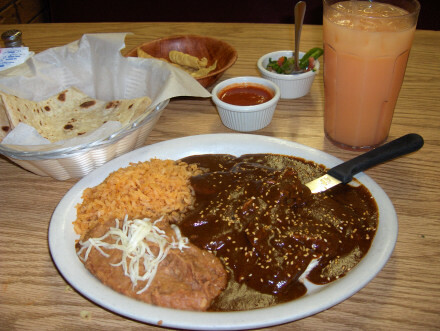 The other notable feature I found at El Jacalito was the special Lent meals they served (I think it is the best in El Paso for this). Breakfast is probably the third thing of note here, although, there is nothing I can tell you about this from personal experience. At lunch I saw a good part of the El Paso City Engineering Department and other people I knew at the restaurant on a regular basis. This is one way I always knew it was authentic, with the no-nonsense engineers seeming to be particularly choosy about their Mexican food. 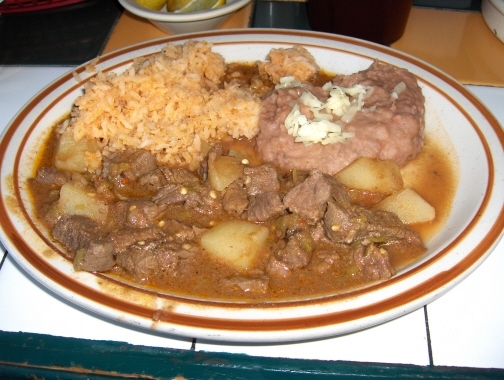 The comida corrida is very popular for lunch at El Jacalito, with the common feature of all comidas being that it comes with caldo de res (beef soup). For the main dishes that came with the dinner I liked some more than others, but I always thought the soup was excellent. 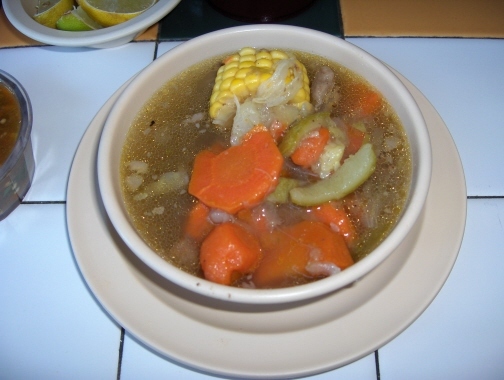 The lunch special comida corrida always starts with Caldo de Res, a beef soup full of more vegetables than meat. The caldos at different restaurants had different features that I liked the best, and I thought the standout here was the vegetables (which were very good and there were more of them than at the other restaurants). The meat was a little fatty (they give you lime slices to counteract the fatty flavor) but the meat was fine. I figured, though, that the best cuts of meat are the ones they served on the plates and the lesser ones were used in the soup. Chile Verde is one of the places where the good cuts of meat go, and I would say this may be the best example of this dish in the city. It is spicier then most, has a higher meat to potato ratio than most, and the meat is leaner than most. Most of all, though, I like the flavor of this dish. I think the spiciness here might not be to everyone’s taste, but otherwise I do not know of any others you could try that are better. 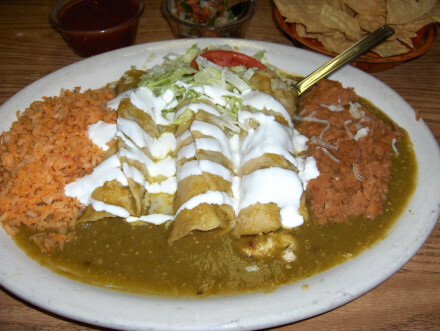 The Mexican Plate probably offers the best choice for lunch, with a taco, enchilada, chile relleno, and chile verde. The rice and beans are very good, but as is the case with most restaurants, the Rice is better. A small dessert is served with the comidas, and I think is always home made. El Jacalito usually has several types of aguas frescas drinks. Lemonade is sweet and has a very good flavor. Horchata is also excellent at Jacalito’s. 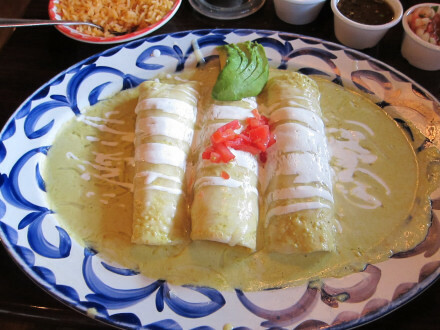 In my opinion, based on a number of years of experience, the meatless dishes at El Jacalito are the weak point of the restaurant. 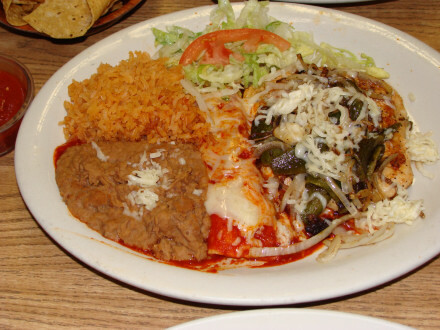 These include the enchiladas and chiles rellenos that seemed too greasy compared to others. 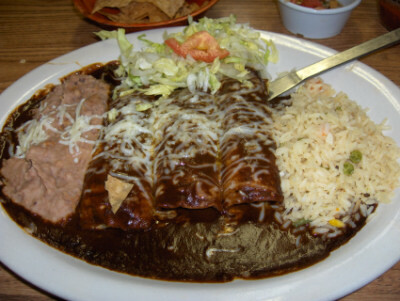 Enchiladas are usually made differently in Mexico than in El Paso, and the ones here are pretty true to the Ciudad Juarez style. Both of these are enjoyable to me, though, on the Mexican plate served with other items. 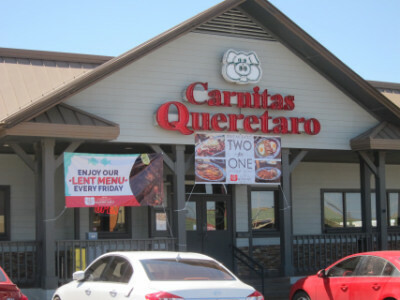 During Lent (on Fridays and other holy days in the Catholic Church) a Lent special is served offering a very good alternative to the normal meat dishes. 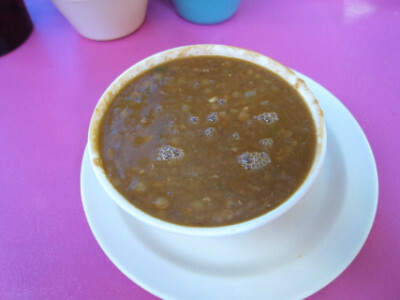 Lentil soup, or Lentejas is always available, and this is usually the highlight of the meal for me. The lentils are always fresh, and the spicing is always just right (this is the part where many other restaurants do not quite stack up). 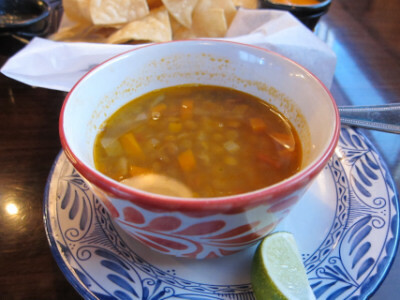 El Jacalito usually has an alternative to the lentil soup if you want to try it instead. I will make note of the fact, though, that in 2019 the lentil soup contained bacon and therefore is no longer vegetarian as I had always noted it to be in the past. It still had an excellent flavor, though. Corn tortillas are excellent with the soup and are free, but you have to ask for them (they come automatically when the main meal is served). 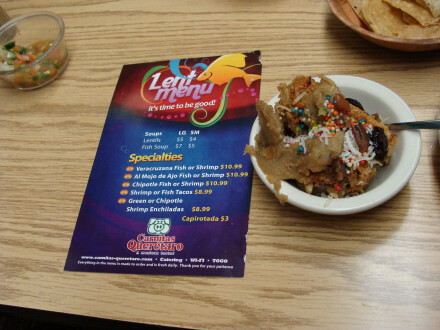 Each Friday during Lent there is at least one traditional fish and one shrimp dish available, and these are rotated each week with most of them being served more than once. 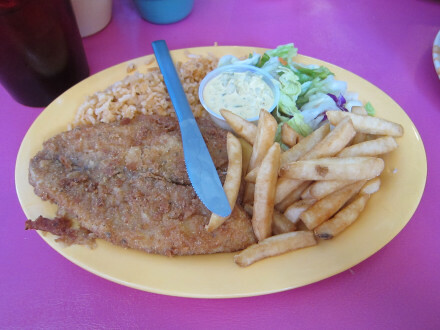 One of my favorites is the Pescado Empanizado (shown above), largely because of the excellent tartar sauce. In 2019, though, I noticed a distinct improvement in both the breading and the flavor of the fish (I think they might have a new cook and this is my theory for the changes I noticed in both the fish and the lentil soup). In any case, I would now say that the fish can stand on its own even without the tartar sauce. 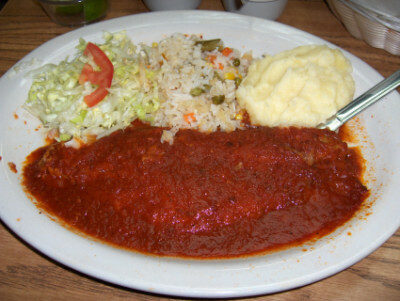 My other favorite is one for which I do not have a photo, but it is the Pescado Veracruzano, a traditional Mexican style fish served with olives on top. When they serve mashed potatoes this is sometimes better than the fish itself, although the french fries are very good as well. 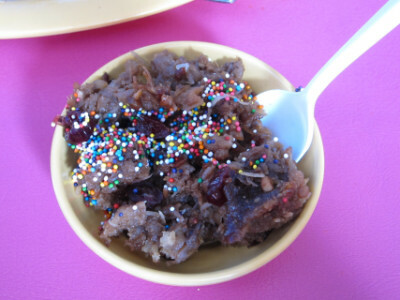 One of the highlights of the Lent dinners is the Capirotada for dessert, a bread pudding with raisins soaked in a syrup that made me think this could not possibly be a special dish for comida de cuaresma since Lent is supposed to be a sacrifice, isn’t it? Jacalito’s still has the best capirotada I have found. 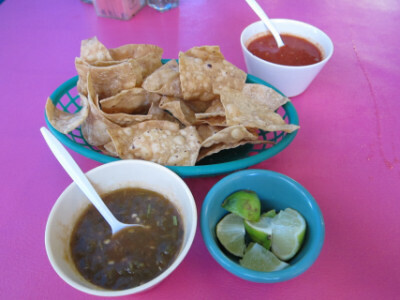 Almost every Mexican restaurant serves chips and salsa, but here you get two types of salsa (these can also double for salsas you put on your meal). El Jacalito has many things I love, and some I could easily skip. 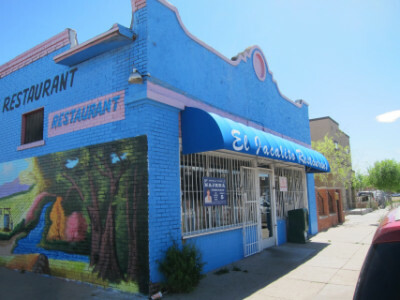 This is a restaurant in a working class neighborhood where many people go every day or at least on a regular basis to get the type of Mexican food they knew growing up. I think people like the variety here, although like me they probably have their favorites. 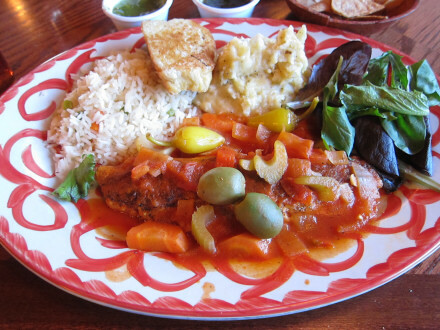 If you have a chance to try the Lent specials comida de cuaresma, I definitely think this is something that should not be skipped. 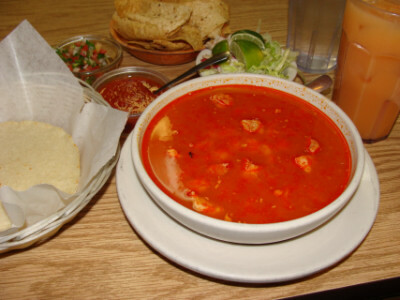 The price here is also very good compared to other restaurants that offer the traditional lentil soup and capirotada.